Friday again… I know I keep saying it but seriously WHERE ARE THE DAYS GOING? This feature Friday I have chosen the incredible Laura Henshaw. I am loving her blog, instagram and latest Ebook (with Steph Smith >> LINK HERE) lately and keep finding myself back on her page (creep)! Not only is her food incredibly delicious and nutritious but she has a wonderful well minded and balanced relationship with food and the health and fitness industry. Being a model she is constantly faced with pressures to be thinner and hotter each day but she maintains a balanced lifestyle with regular exercise, healthy wholesome foods and 7-8 hours sleep each night. Laura loves her on the go high protein snacks and has recently started a protein company of her own called Four Protein >> site HERE. 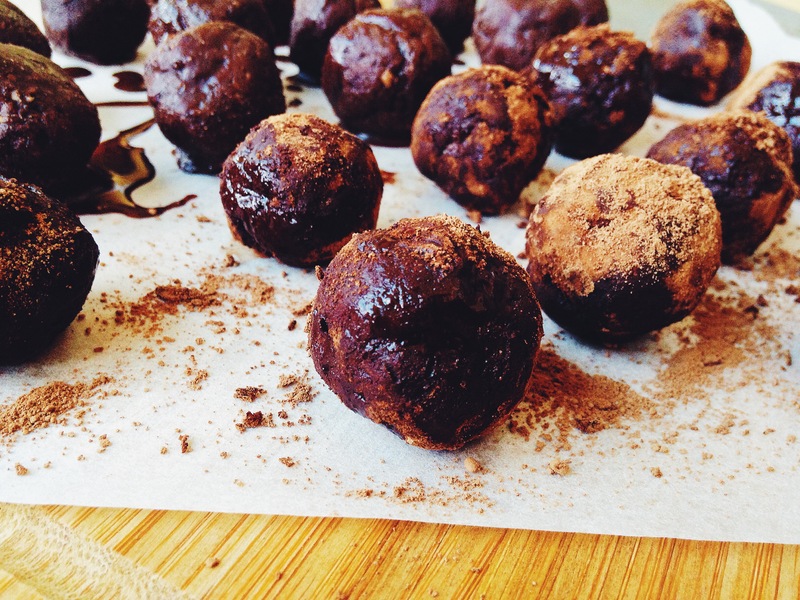 Laura says “My favorite snack are these delicious little protein filled chocolaty balls. They are packed with protein, good fats (from the nuts) and taste amazing (tick all the boxes.) 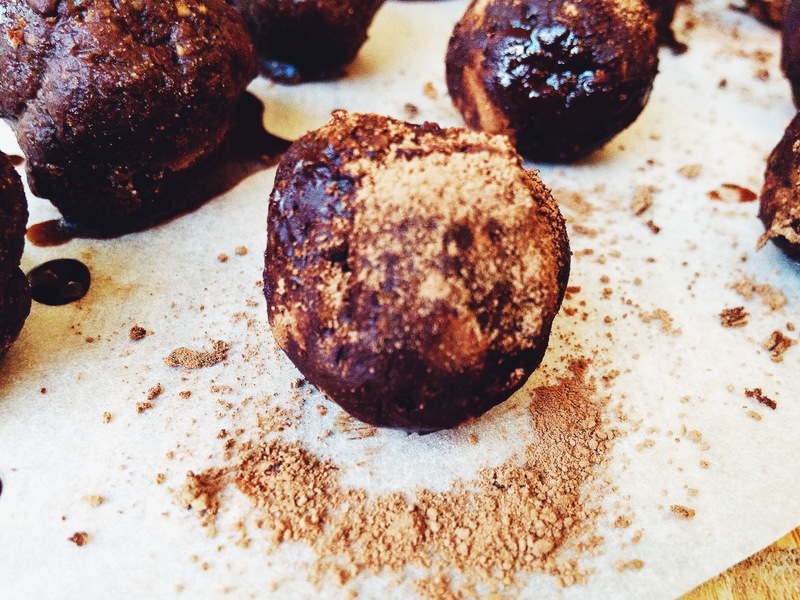 The best part is they are completely clean and although taste like chocolate have zero added sugar.” This recipe for Chocolate Covered Cacao Fudge Protein Balls made me drool and I think you should all try it out this weekend. Nothing like a little chocolaty goodness to get you in the mood for the weekend!! 1. 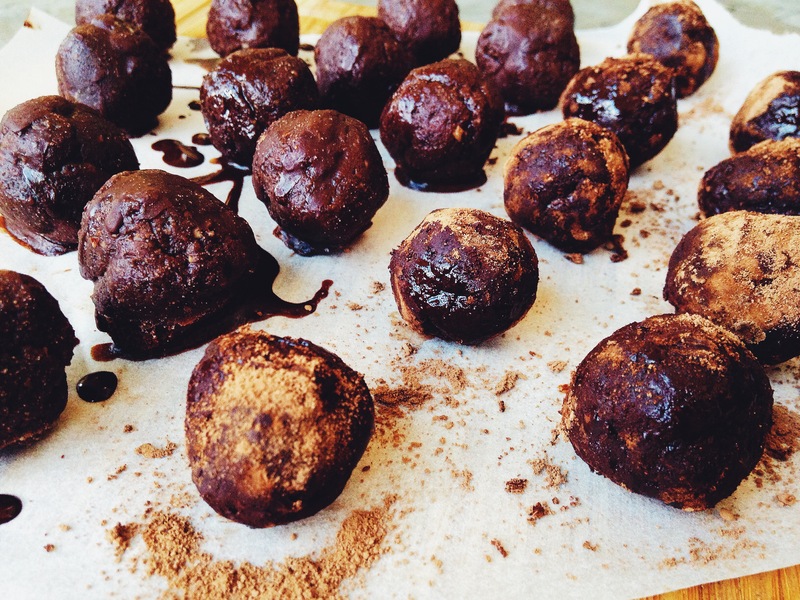 Combine all ingredients (a part from extra coconut and cacao for rolling) for the protein balls in a food processor until combined. 2. Once combined roll into balls – I prefer mine quite small but you can make them whatever size you like. 3. 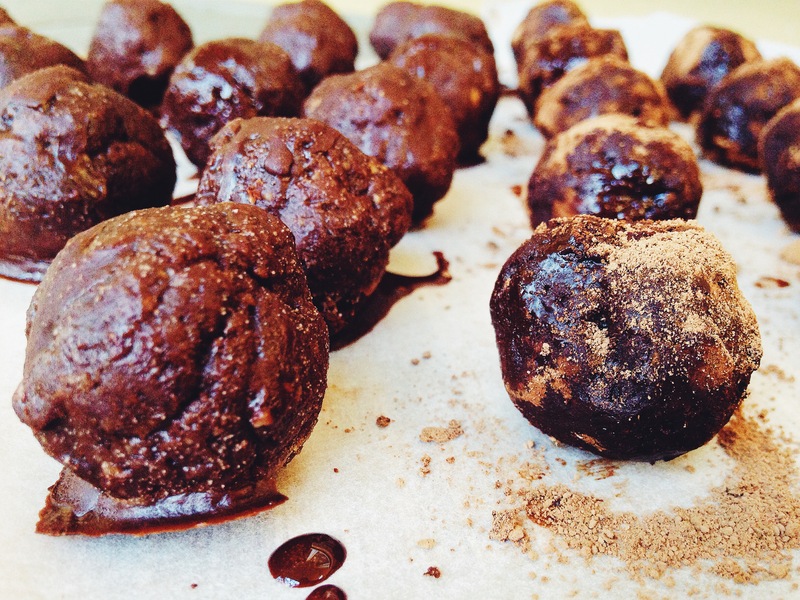 Melt coconut oil and mix in cacao powder and stevia. 5. Put balls rolled in chocolate mixture in the freezer for 15-20 minutes until mixture sets and then transfer to fridge. Balls not covered in the chocolate mixture can go straight into the fridge! *** You can sweeten with your preferred sweetener- coconut sugar or honey also works. Yes that’s right – spinach and NO you cannot taste it but it makes the slice look incredibly green and the kids (or fussy partners) won’t even know it’s in there. I am all about the hidden veggies and extra nutritious ingredients. Refined sugar free, dairy free, gluten free and paleo friendly this slice is sure to impress. Perfect slice to whip up before a bbq or to take for dessert at a dinner party or kids party. Every one will love it ! You can eat it straight from the freezer or simply let it thaw for 5-10 mins. I like it straight from the freezer because it takes me longer to eat it and therefore I enjoy it more!! Simply cut yourself a square and you’re nourishing with the best of minerals, fats, amino acids and healthy carbohydrates. Your body will love it – not to mention your taste buds!!! Place all base ingredients (except the cacao nibs if you are adding them) in a food processor and pulse until well combined and smooth. Add the cacao nibs and pulse lightly for an extra 15-30 seconds. The added crunch is divine. Spread base into a lined tin and place in freezer. Meanwhile place all the coconut mint cream ingredients in the food processor and process until combined and creamy. This may take up to 3-4 mins. Spread evenly over the base and place back in the freezer. In a clean bowl combine the melted coconut oil, cacao, syrup (and optional mint) for the chocolate topping. Stir until combined and all the cacao lumps are gone. Pour oven the mint cream and place back in freezer for up to 6-8 hours to completely set. Can store in the freezer for up to 6 weeks but I can guarantee it wont last that long! Another ‘hot’ health craze going around at the moment is pouring your smoothie into a bowl and eating it with a spoon. Yep forget jars in 2015, it’s all about the bowls… and even more about the copious amounts of decorative toppings. My favourite ice cream flavour would have to be choc mint hands down, followed closely by coconut. 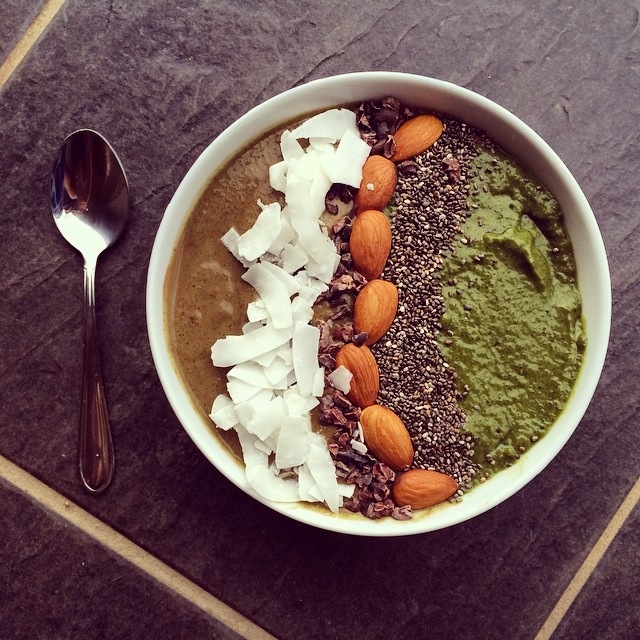 This smoothie bowl literally tastes like you have smashed a whole packet of Arnott’s mint slice. Definitely worth a try! Blend until thick and well combined. Pour HALF into one side of a bowl. and blend. Pour into other side of the bowl. Top with almonds, chia seeds, coconut, cacao nibs, goji berries or buckinis. Go wild! !